Jimmie Walker is actually quite funny - Stand and Deliver! I can remember the time when two new television shows first hit the screens in Australia. They had similar names, so I wasn’t sure which was which, and they were both on at the same time, on different stations. One was called Happy Days and the other was called Good Times. After a while, one of them must have been moved to a different timeslot, because I know we watched both: one was a nostalgic look at 50s middle class America in Milwaukee, the other, a gritty look at contemporary working class American life in Chicago’s black ‘projects’. Both offered the comic relief of a main character with a catch-phrase: Fonzie’s ‘Aaaaaaeeeeeeeeeeh’, compared to JJ’s ‘DYNE-O-MITE’. The only drawback of the night was the lack of audience – comedy always plays better to fuller rooms and bigger audiences. However, the people who were there were for the most part, fans, and Jimmie Walker happily fielded questions at the end – he hadn’d visited Australia before, so he was happy to answer any queries long-term fans had been cultivating since the 70s. But he would not give us a ‘DYN-O-MITE’ claiming that that sort of material had to be paid for: he just might do it at Vegas, but certainly not at the Harbord Diggers. 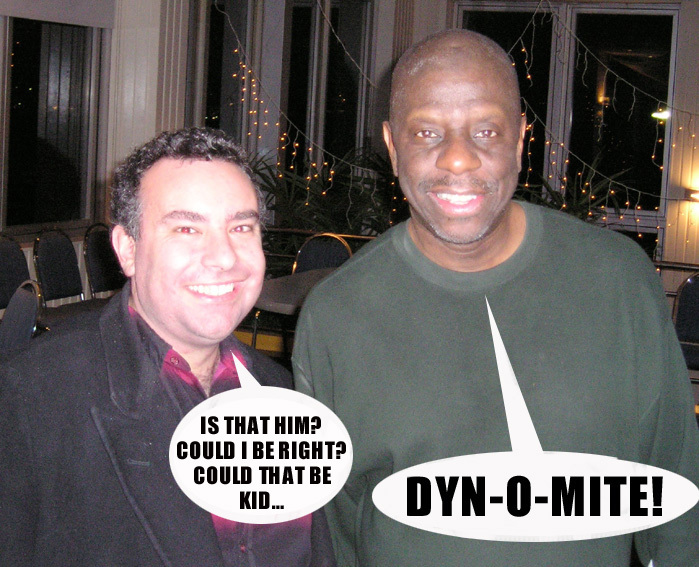 In addition to being genuinely funny, Jimmie Walker is also a dude; I first interviewed him on Thursday 29 April, before attending a Gud gig. I didn’t discover until midday the following day, when I was about to head in to edit the interview, that my minidisc recorder had somehow malfunctioned, and I’d failed to record the interview. At the last gig of his Australian tour, Jimmie was happy to let me interview him again. The interview was broadcast Saturday 8 May. Here’s an MP3 version if you want to listen. Demetrius Romeo: Jimmie, I understand you were a stand-up comic before you landed the role in Good Times. JIMMIE WALKER: Yeah, I was a stand-up for about ten years before that, working in New York and part of the Improvisation graduating class that was there in the early 70s and late 60s which included Bette Midler, Al Jarreau, David Brenner, Liza Minelli and many, many others that were around at the time. Demetrius Romeo: Was it common for stand-up comics to land roles in sitcoms at the time? JIMMIE WALKER: At the time, no. It was a whole different thing. The first three, besides Bill Cosby of course on I Spy, were me, Gabe Kaplan and Freddie Prinze Senior. Now a lot of people obviously know Freddie Prinze Junior but Freddie Prinze’s dad was on a show called Chico and the Man, Gabe Kaplan was in Welcome Back, Kotter and I was in Good Times. Demetrius Romeo: Did you use much of your pre-existing stand-up persona in the role of JJ on Good Times? JIMMIE WALKER: No, not really. I made a character out of the whole thing, a combination of all the people I’d known who did that. My comic timing, from being a comedian, obviously was involved on the show, but not from the ‘JJ’ character; that was a hole bunch of characters that I put together. Demetrius Romeo: How about after you did the show – did the role of ‘JJ’ effect the way you did stand-up comedy? JIMMIE WALKER: It never effected the way I did stand-up comedy, but it effected the way people perceived me. Because, when you work clubs, not everybody sees you but when you’re on national TV, a lot of people see you. So a lot of people thought, “Gee, this is JJ, he’s gonna come out…” They didn’t know that I was a stand-up, so definitely, it effected the way they looked at me in terms of my comedic presence, because I was dealing with more mature subjects, and they didn’t plan on getting that from JJ. So, it definitely changed a lot of stuff in terms of acting, not to say that I’m an actor, but people don’t see you; you get typecast. Those sort of things do happen. “If Farmer Jones had a fifty acre farm that he had to mow, it would take Farmer Jones Twelve hours with a team of horses, but it would only take him six with a tractor. “One day while mowing the lawn the tractor broke down, so Farmer Jones had to go to the horses. But he decided to use his son who, by hisself could mow a lawn in fourteen hours. Demetrius Romeo: Before you made it in showbusiness, you educated yourself. Did any of that effect the show in which you were the son of a family struggling in the projects? JIMMIE WALKER: I think it did, because I actually came from that kind of family, except that we didn’t have a dad. We had a dad in our show, but we didn’t have a dad in real life. So I think it does affect you in that you have a lot of characters that you have in the projects, and like I said before, it was the kind of thing where a lot of the project characters were incorporated in what I did on the show, because obviously there’s a malaise, a whole bunch of people that you see that you just put all those characters together. Is that him? The black prince? Demetrius Romeo: Part of your persona on Good Times involved a catchphrase ‘dynamite’, which became part of everyday parlance and lived beyond the show. How does that effect you when part of your television shtick becomes part of everyday life? JIMMIE WALKER: Well, definitely, here we are thirty, thirty-five years later, and people are still screaming it, yelling it, the whole deal. It is part of the fabric, literally, of the world, I would imagine. And as my late friend Steve Krantz – a writer – said, he said, “when you die, the obit’s going to say, ‘today, the dynamite fizzled’”. So that’s definitely going to happen. I’m very aware of that, I’m very aware that that’s what people know, that’s what they’re aware of, and you have to be very honest about that. Demetrius Romeo: Do you still give a bit of a ‘Dyn-o-mite’ in your performance? JIMMIE WALKER: [Lauging] Never! See, I’ve never done it in my show, ever, ever really done it in my show. But I know there is a percentage of the crowd who come to see that, they enjoy that, they’re into that, and I’m very aware of that. Demetrius Romeo: But your website is called dynomitejj.com, you’ve got CDs that are called Dyn-O-Mite. How do you justify that? JIMMIE WALKER: Purely marketing and mercenary conception. You know, it’s worked out well because people do look for me under that label – you’ve got to be honest about that. Demetrius Romeo: So what about the people who come to the show expecting to thinking that they’re seeing JJ and not Jimmie Walker? JIMMIE WALKER: You try to win them over, you try to prove to them that you are funny, kind of stuff like that. You know, you’re not going to get everybody but you hopefully can get a large percentage. Demetrius Romeo: Is it working? JIMMIE WALKER: I think we’re doing okay. I think it’s fine. I think people are enjoying what they see. Maybe, maybe not; but I hope they are. Demetrius Romeo: Fantastic. Jimmie, it’s been a pleasure. JIMMIE WALKER: Thank you. As usual, always sensational being on a big show, love it! Ain’t we lucky we got ’em?